Chinese New Year starts with the New Moon on the first day of the lunar New Year. The Asian New Year can fall anywhere between late January and the middle of February, due to cyclical lunar dating. On the Western calendar, the start of this New Year falls on January 28, 2017, The Year of the Rooster. On the Chinese calendar, 2017 is Lunar Year 4712. And if you were born in 1957, 1969, 1981, 1993, 2005, or 2017, it’s your year. In Chinese culture, the Rooster represents fidelity and punctuality, for it wakes people up on time. People born in the year of the Rooster are beautiful, kind-hearted, hard-working, courageous, independent, humorous and honest. They like to keep their homes neat and organized. Roosters have a quick wit and think fast, so sometimes they are impatient. New Year’s Eve and New Year’s Day are celebrated as a family affair, a time of reunion and thanksgiving. Celebrations can go on for the next month. There are many traditions and symbols to ensure health, wealth and happiness. As always, the New Year is marked with symbols of hope and prosperity, and of course, sumptuous food. For good luck and good fortune—or just plain good fun—here are some customs and foods to celebrate the coming year. Oranges and Tangerines: Tangerines with leaves intact assure that one’s relationship with the other remains secure. For newlyweds, this represents the branching of the couple into a family with many children. Oranges and tangerines are symbols for abundant happiness. Plants and Flowers: Every traditional household should have live blooming plants to symbolize rebirth and new growth. Flowers are believed to be symbolic of wealth and high positions in one’s career. Lai See or red envelopes filled with money: Typically given by the married to the unmarried, most of who are children. The red color of the envelope symbolizes good luck and to ward off evil spirits. 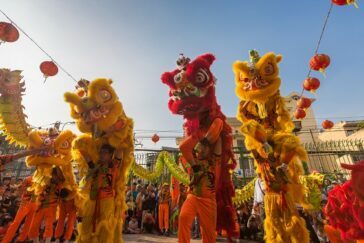 The Lion Dance: The lion dance has been part of the Chinese culture for thousands of years and is performed on auspicious occasions such as weddings, store openings, and of course, New Year. The lion is a symbol of power, wisdom, and good fortune, longevity, and good luck and chases away evil spirits and brings happiness. The lion dance is performed at many restaurant and business locations during the Chinese New Year’s Celebration. Check within your local community and see where a lion dance may be performed. House cleaning: The entire house should be cleaned before New Year’s Day. On New Year’s Eve, all brooms, brushes, dusters, dust pans and other cleaning equipment are put away. Sweeping or dusting should not be done on New Year’s Day for fear that good fortune will be swept away. Food — Chinese Dumplings: With a history of more than 1,800 years, dumplings are a classic Chinese food, and a traditional dish eaten on Chinese New Year’s Eve especially in North China. Legend has it that the more dumplings you eat during the New Year celebrations, the more money you can make in the New Year. I’m offering a traditional meat dumpling recipe. Made with mushrooms, MSG and soy sauce rich in umami, the savory taste is so good you will have no trouble eating many, and ensuring a prosperous new year. 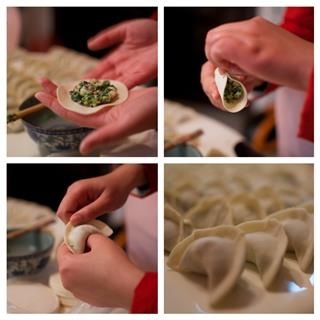 While making the dumplings, cover the wrappers with a damp towel to prevent drying. Place ~1 tablespoon filling in middle of wrapper. Brush edge with a little beaten egg. Fold over in half to form a crescent. Stand crescent on flat edge and turn each pointed end inward. Place on well-oiled heat-proof plate. 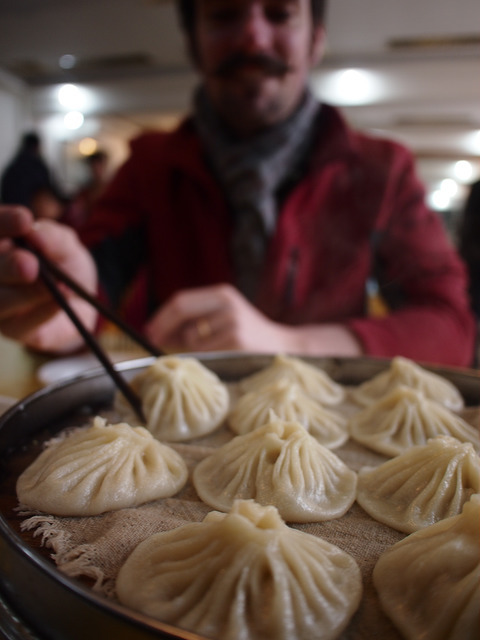 Chinese dumplings can be made to look like Chinese silver ingots, which are not bars, but boat-shaped, oval, and turned up at the two ends. See illustration. Place plate on steamer rack. Cover and steam 15 minutes, and serve directly from the steamer. And tell the children to be good. Events that take place during this time set the tone for the rest of the year! Mary Lee Chin is a registered dietitian specializing in health communications. Committed to providing the public with sound nutrition information, she is regularly consulted by local and national media on nutrition trends and significant health and food issues. Her company, Nutrition Edge Communications, specializes in translating peer-reviewed research into realistic and practical recommendations, and countering myths and misinformation. Mary Lee was recently awarded Outstanding Dietitian of the Year by the Colorado Dietetic Association. Read more about her background on the About page. Previous PostWhy Is MSG Gluten Free?